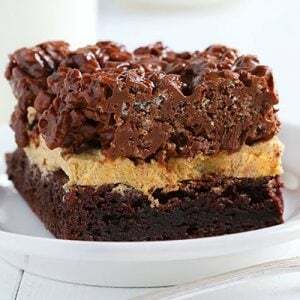 These perfectly gooey double chocolate brownies are paired with a dreamy pumpkin frosting and topped with peanut butter chocolate Rice Krispies! Heat oven to 350°F (325°F for dark or nonstick pan). Grease bottom only of 9-inch square pan with cooking spray. For easier cutting, line pan with parchment or foil. In the bowl of a stand mixer, beat softened butter for 2 minutes. When ready to assemble dessert, spread frosting over cooled brownies. In 1-quart saucepan, melt peanut butter and chocolate chips over low heat, stirring constantly. Remove from heat. Pour cereal into saucepan, stirring until evenly coated. Spread over frosted brownies. Refrigerate 1 hour or until set before cutting. Store tightly covered at room temperature or in refrigerator.